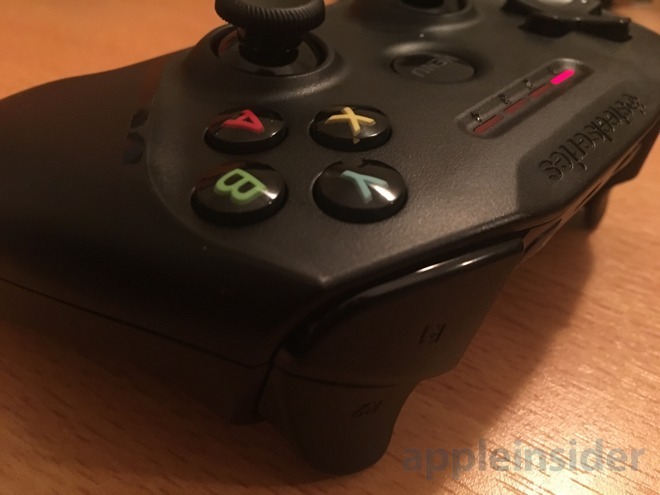 The SteelSeries Nimbus is priced at $49.95, and connects via Bluetooth to the fourth-generation Apple TV, iPhone 5 or newer, iPad 4 and newer, and the fifth-generation iPod touch and newer. That's half the price of the first "Made for iOS" gaming controllers that first began to appear after iOS 7 added support, marking a huge improvement for the Made for iOS accessory market. 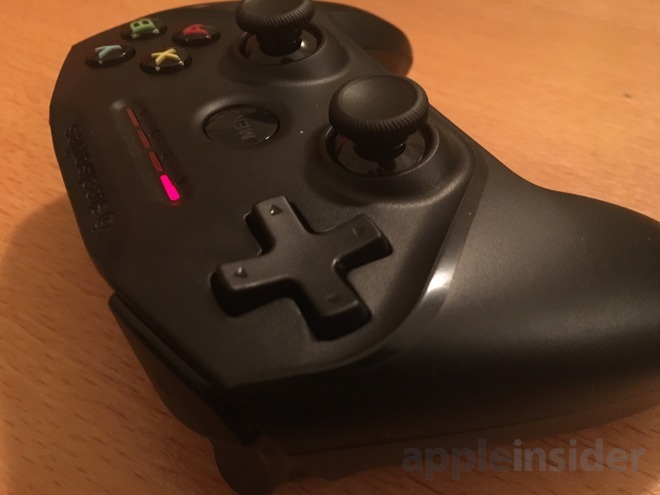 SteelSeries provided AppleInsider with a Nimbus for this review. Inside the box is a controller and a manual, though you'll need to bring your own Lightning cable for charging (we're guessing you already have a few of those). 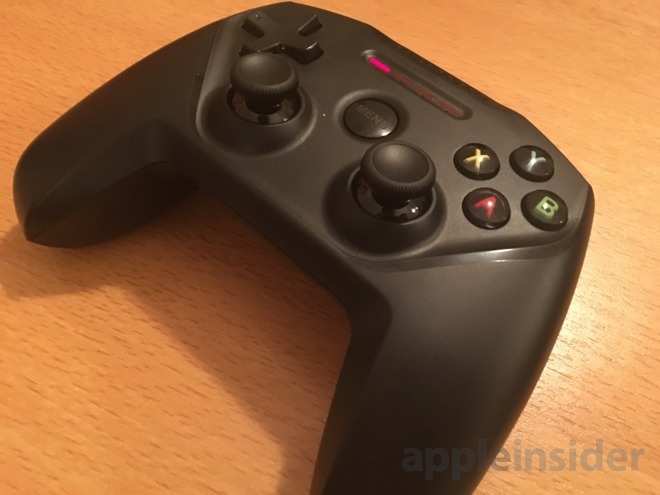 Apple-sanctioned gaming controllers got off to a poor start back in 2013, but as has been noted by our reviews, the options have steadily gotten better over the years. That said, there hasn't yet been a controller we could wholeheartedly recommend without some reservations. Thankfully, that's changed with the SteelSeries Nimbus. Our last look at a SteelSeries product was the company's ambitious Stratus micro-controller, a unique form factor that made bold choices but ultimately suffered for them. The SteelSeries Nimbus makes no such concessions. Right out of the box we were able to appreciate its fantastic construction and solid build. This is not a cheap piece of plastic— for $50, you really feel like you're holding a premium controller, which is how it should be. The rigid body on the SteelSeries has absolutely no give to it. It even has a slight bit of "heft" to it, which we think was a wise decision. The design places the D-pad on the upper left side, and two analog sticks on the inner left and right side. The upper right side has the face A, B, X and Y buttons. The in-hand feel is akin to Microsoft's Xbox controllers, while the analog stick placement is similar to Sony's PlayStation sticks. The D-pad is serviceable, as most controller D-pads are these days, while the analog sticks are excellent. The face buttons are also outstanding, responsive and comfortable. The front face of the controller also features a nice, large menu button, and four LEDs identifying which player number the controller is assigned as. Up top, there are four shoulder buttons. 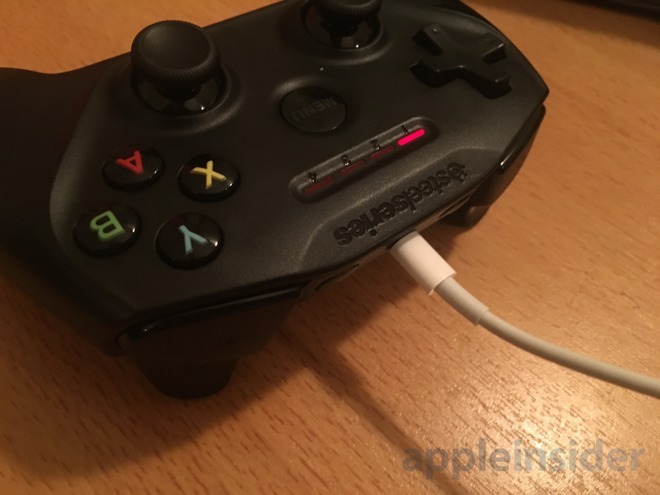 The two lower triggers are outstanding and feel very solid when pulled— they are the best of any iOS- or Apple TV-compatible controller to date. The bumper buttons above the triggers are slightly larger than we'd prefer, but are still comfortable and easy to press, and give a satisfying mild click when fully engaged. In between the four buttons up top is a hold switch for turning the controller on and off, a Bluetooth button that can be held to easily enable pairing mode, and a Lightning port for recharging the controller. Our hats off to SteelSeries for the best-constructed Apple-certified controller we've seen yet, and achieving it at a competitive price that most gamers can tolerate. It is here once again that we are happy to report improvement from our previous reviews: Our main knock against MFi controllers was actually Apple's fault, because the App Store does not identify which downloads support third-party gaming controllers. No, Apple hasn't fixed the iOS App Store. But it has launched the new Apple TV with tvOS App Store, where game controller support is clearly identified before a title is downloaded. Just one simple change has made the experience on Apple TV that much better. And, thankfully, the SteelSeries Nimbus was designed with the Apple TV in mind. Here, the controller works as you would expect. Once paired with the Apple TV through a simple setup in the tvOS Settings app, it will maintain its connection. That means turning on the controller will bring the Apple TV out of sleep mode. 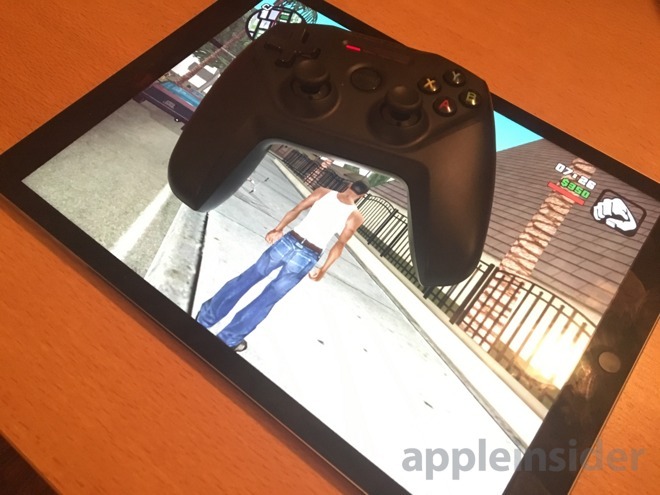 And the buttons on the controller can be used to navigate the Apple TV in place of the Siri Remote, including non-gaming apps. 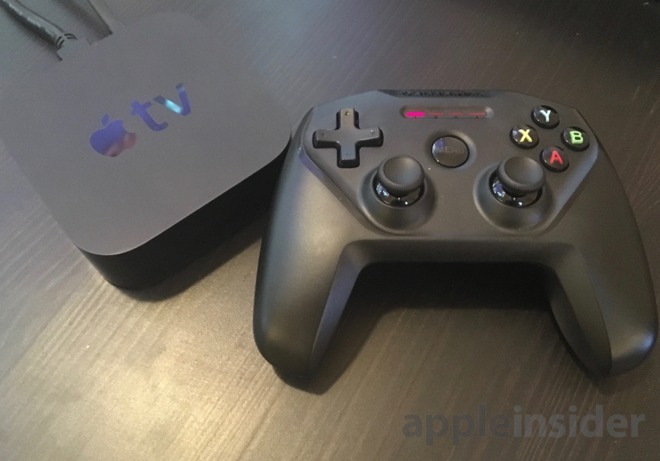 Game controller support on the Apple TV at this early stage is good, but could use improvement. There are some decent titles available, some of which are cross-buy and iCloud sync compatible, though some titles would benefit from options like control customization (why can't we switch the thumbsticks in Geometry Wars 3?). Moving away from the Apple TV, the SteelSeries Nimbus also works with iPad, Mac, iPhone, and iPod touch. We tested the controller with our iPad Pro and iPhone 6s and found that it worked as expected, just like other game controllers before it. That said, we can't recommend the SteelSeries Nimbus to iPhone or iPod touch gamers, because the accessory has no clamp to hold the iPhone. While suited for couch gaming, or with an iPad propped up with a Smart Cover, most gamers will likely want a way to hold their iPhone at a desirable viewing angle when playing with a controller. There are other options for iPhone gamers, and our recommendations with comps would be the Mad Catz Micro C.T.R.L.i (which lacks a rechargeable internal battery or the Moga Rebel (which starts at $70). But we don't think iPhone gaming is the intended market for this SteelSeries accessory. Introduced alongside the fourth-generation Apple TV, this is clearly intended for living room use, and it fits that bill perfectly. SteelSeries says the Nimbus is rated for 40-plus hours of battery life on a single charge. We didn't put that number to the test, but it came out of the box fully charged and remained operational for us after hours of use. Being the first controller on the market with Lightning support is yet another feather in the Nimbus's cap, meaning users will be able to charge the device the same way they do their Apple TV's Siri Remote. The SteelSeries Nimbus is a fully featured gaming controller with exceptional construction, convenient Lightning port recharging, and compatibility with Apple's full range of products. Priced at $50, which is $10 less than controllers for major consoles like the Xbox One and PlayStation 4, it's competitive. 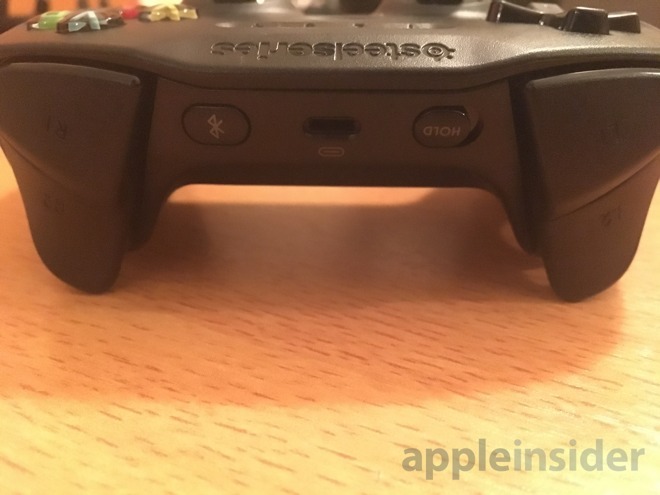 We will note that modern gaming console controllers feature rumble feedback and motion sensors, but Apple's MFi certification doesn't support those capabilities. It's been a long time coming, but more than two years after official Apple-approved controllers began hitting the market, we've finally found one we can wholeheartedly recommend— as long as you don't want to use this with your iPhone. If you plan on playing a number of games on your Apple TV or iPad, the SteelSeries Nimbus is currently the one to get. The SteelSeries Nimbus is currently exclusive to the Apple Store, both online and at its retail locations.